piLLai lOkam jIyar’s vyAkyanam of thaniyan in maNipravALam (a writing style in which thamizh and sanskrit are mixed) is being translated here. This thaniyan sings pallANdu (mangaLAsAsanam/well-wishes) to thirumangai AzhwAr who sang the six prabandhams that provide protective walls to emperumAn, like the compound walls that protect our temples. Acharyas are to be praised directly in front of them. AzhwAr is present in archai thirumEni in many dhivya dhEsasms. This thaniyan sings pallANdu to such an AzhwAr. (vazhiy)arO – ‘asai’ as part of thamizh grammar. vAzhi parakAlan – pallANdu to AzhwAr who got the name of parakAlan. ‘para[r]’ (others) refers to those who deny emperumAn. AzhwAr is a strong force like yama for such people. So AzhwAr is parakAlan. vAzhi kali kanRi – pallANdu to AzhwAr known as kali kanRi (one who can rid of illness of kali yuga). kuRaiyalUr vAzh vEndhan vAzhi – pallANdu to the king of, the one who was born in, and the one who protected, the place of thiruk kuRaiyalUr. mAyOnai vAL valiyAl mandhiram koL mangaiyar kOn thUyOn sudarmAna vEl. mAyOnai – AzhwAr got the thirumanthram by threatening emperumAn using the strength of his sword, the ‘mAyon’ who is in thiruvarangam (srIrangam) lying on the Adhi sEshan. As it says ‘mAyOn’ in “kadi arangathu aravANaiyil paLLi koLLum mAyonai” [perumAL thirumozhi 1-2], and as it says “vAzhi suzhi poriththa nIr ponnith then arangan thannai vazhi pariththa vALan vali”, it was arangan from whom AzhwAr got thirumanthram using the strength of his sword. AzhvAr got thirumanthram from the emperumAn who is mandhiram (manthram), like it is said in ‘andhaNar mAttu andhi vaiththa mandhiram’ [thirunedunthANdakam 4]. mangaiyar kOn – AzhwAr is king of thirumangai, isn’t it? thUyOn – AzhwAr is having both inner and outer purity. ananyArha sEshathvam (no subservience to anyone else), ananya saranathvam (not using anything other than emperumAn as the means to attain Him), ananya bhOgyathvam (not considering anything other than emperumAn as enjoyable) are some of the inner purities of AzhwAr. Having undergone pancha samskAram, etc., are part of his outer purity. AzhwAr also gave all of his names in one pAsuram, and those names also show us his inner and outer purity: angamalath thada vayal sUzh Ali nAdan, aruL mAri, arattamukki, adaiyAr seeyam kongu malar kuzhaliyar vEL mangai vEndhan, kORRavEl parakAlan, kaliyan [periya thirumozhi 3-4-10]. sudar mAna vEl – big spear that is made of brightness; well qualified to be held by thirumangai mannan who is bright and great. thUyOn vEl vAzhiyarO – thaniyan says that like AzhwAr his spear is also worthy of being sung pallaNdu. Didn’t ANdAL also sing in thiruppAvai , ‘nin kaiyil vEl pORRi’? When singing pallANdu to kaNNan, they too sang pallANdu to his spear also. AzhwAr also says ‘koRRa vEl‘ [periya thirumozhi 3-4-10] about his spear – so unlike other spears which see losses, the one he carries always sees victory; but still because of his [AzhwAr’s, or the one who wrote the thaniyan, that is, emperumAnAr’s] love towards AzhwAr’s spear, pallANdu is being sung for it also. namakkuth thuNai – is our shelter. This entry was posted in iyaRpA, thiruvezhukURRirukkai and tagged 4000, azhvar, azhwar, dhivya, divya, english, introduction, jeeyar, jIyar, kutrirukkai, lokam, meanings, pillai, prabandham, thaniyan, thirumangai, thiruvezhikURRirukkai, thiruvezhu, vyakyanam on April 20, 2015 by raghuram. 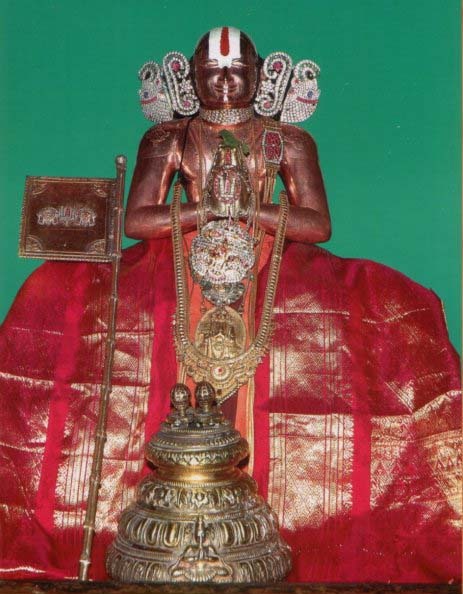 thiruvezhukURRirukkai (pronounced as thiruvezhukUtrirukkai) is one of the prabandhams sung by thirumangai AzhwAr. 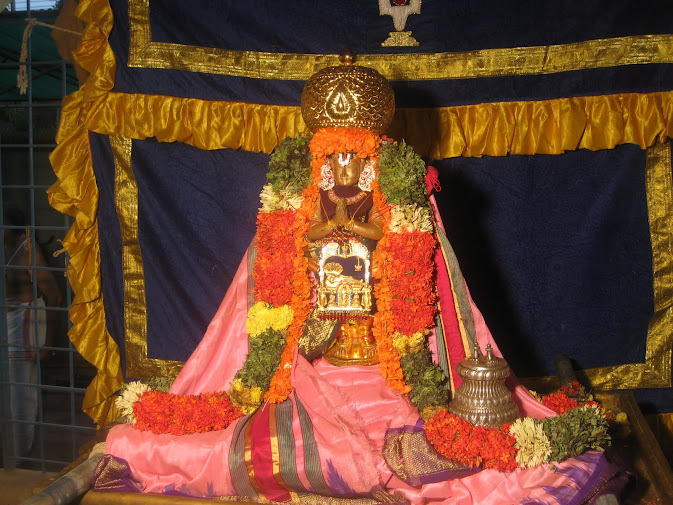 thirumangai AzhwAr sang periya thirumozhi first; he ended with the prayer to emperumAn to help get rid of the dhEha sambandham (relationship of AthmA with the body). In his second prabandham thirukkuRunthANdakam, since emperumAn did not show himself to AzhwAr as He wanted AzhwAr to have more hunger for His visit, AzhwAr was not able to bear the delay, and like how an extremely thirsty person would drink and immerse himself into the water, and pour water on himself, AzhwAr sang about emperumAn by talking, and prostrating, and thinking about Him, and tried to sustain himself. About the name of the prabandham: ezhu – 7, kURu – parts, irukkai – being/having. Or, it is in 7’s – that may be based on poetry based on time, place, counts, is referred to as ‘chiththirak kavithai’ – we can draw thiruvezhukURRirukkai, in the form of a chariot. The chariot starts with a small width and becomes wider and wider. In the same way, thiruvezhukURRirukkai uses numbers 123 in one line of the pAsuram, then uses 12321 in the next line, then 123454321, 12345654321, 1234567654321, and again 1234567654321. This form of poem is called ratha bandham. thiruvezhukURRirukkai is recited at the start of thEr (chariot) uthsavam in many dhivya dhEsams. This translation is not meant to be done word by word; it is attempted to provide salient points of the vyAkyAnams. Please contact us if there are any corrections required. As always, your reading and providing valuable comments are welcome. vyAkyAnam is provided by the vyAkyAna chakravarthy (emperor of commentaries), that is, periyavAchchAn piLLai. Detailed description provided by puthUr swami has helped understand more meanings of the vyAkyAnam and it was necessary for doing any level of translation here. Translation by Raghuram Srinivasa Dasan. This entry was posted in iyaRpA, thiruvezhukURRirukkai and tagged 4000, azhvar, azhwar, dhivya, divya, english, introduction, jeeyar, jIyar, kutrirukkai, lokam, meanings, pillai, prabandham, thaniyan, thirumangai, thiruvezhikURRirukkai, thiruvezhu, vyakyanam on April 10, 2015 by raghuram.